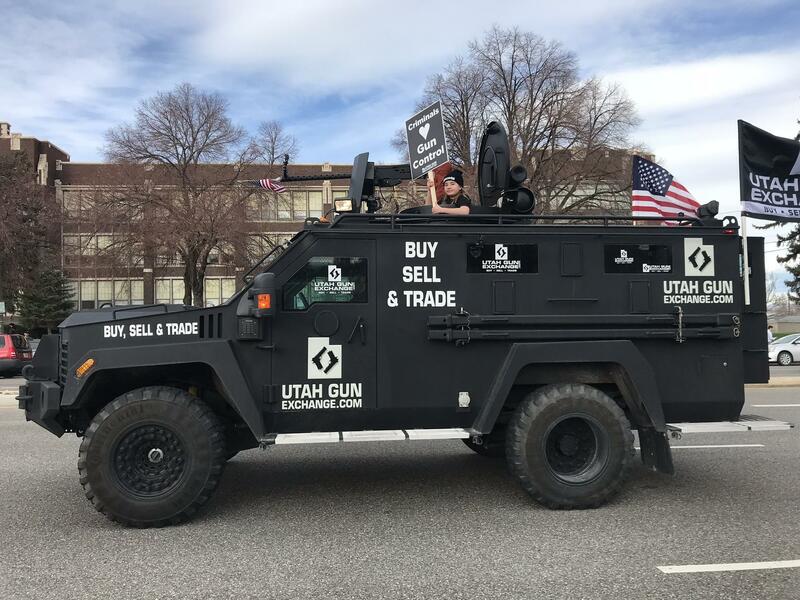 Pro-gun supporters march with Utah Gun Exchange during a rally in March. From behind the wheel of a black Bearcat armored truck, speaking through a PA system, Bryan Melchior had a message for the people of St. Petersburg, Fla.: "Arm yourself!" The co-owner of the Utah Gun Exchange, an online marketplace for guns buyers and sellers, Melchior is also a provocateur these days, especially when it comes to questions of gun control. Separately, student survivors of the February shooting at Marjory Stoneman Douglas High School in Parkland, Fla., have been traveling the country talking about gun control as part of their March For Our Lives tour. Shadowing them are Melchior and his employees, who have launched their own, shadow Freedom Tour with its own message, often broadcast from the menacing vehicle's loudspeaker. An armored personnel carrier like that gets attention, and Melchior said he gets comments from passing drivers all the time. On Thursday, he responded to passers-by to look up to the company's Facebook page, and his message for them to stand up for the Second Amendment rights. Melchior and a small team drove out to Florida to ensure a pro-gun presence at a March For Our Lives tour traveling the state. The gatherings are known to attract gun control advocates, but Melchior thinks both groups have a common cause. Melchior thinks tragedies are best prevented by improved school security and providing concealed carry training for teachers. Melchior said his group originally was not welcomed at the March For Our Lives events, but there's been a shift. On Tuesday he and his team sat down with a group of the student activists and spoke for 30 minutes. The Utah Gun Exchange isn’t having much luck making inroads in their home state where a separate March For Our Lives tour is scheduled to make a stop this Saturday. Members of Melchiors group announced they planned to attend the Utah event, which led to the venue — a movie theater in South Jordan — pulling out at the last minute out of fear of the two groups clashing. We would also like to remind the media and all involved parties that Utah Gun Exchange is not a nonprofit organization like the National Rifle Association, or a legislative advocacy group like Utah Shooting Sports Council. Utah Gun Exchange is a business. We are not obligated to mold our movement for gun reform and public safety around the desires of a business whose financial success could be negatively influenced by our legislative goals. 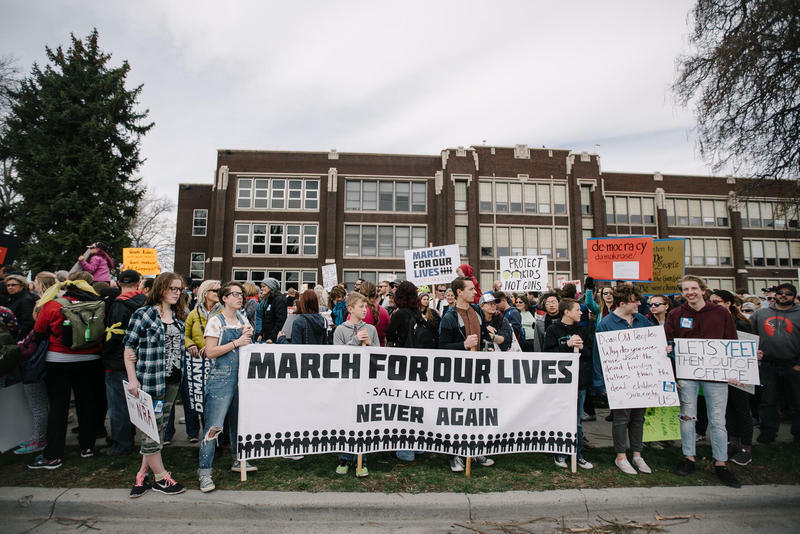 We are happy to continue the conversation, as demonstrated by the recent meeting between students from the national March For Our Lives chapter and Utah Gun Exchange members who traveled to Florida and are following the Road to Change tour, but would like the narrative to remain rooted in facts and reality. We are not going to be distracted from our message, and look forward to continuing our educational and legislative agenda. The event organizers also announced Thursday that the event will now be held at the Mountain America Expo Center in Sandy. They said the location was chosen in part because it falls within the boundaries of Mia Love's (R-Utah) congressional district. Love has been targeted by March For Our Lives as a lawmaker who has benefited from donations by gun rights lobbyists. Activists from a high school in Parkland, Florida have found a new venue to hold an event this Saturday after their original plans fell through. As part of a March For Our Lives national tour, a town hall discussing school safety will take place at the Mountain America Expo Center in Sandy.